The silver chart today has many investors on edge because of the parabolic spike seen since August 2010 when Bernanke hinted that QE 2 was coming. Investmentscore.com did an excellent job this morning comparing silver's current bull market run to that of the NASDAQ from its lows during the 1970's to its first spike move higher in 1991. 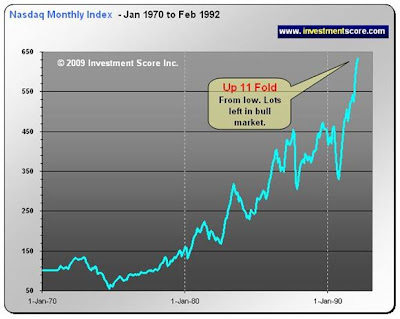 It is important to remember the psychology around the NASDAQ back in 1991. A new phenomenon called the "Internet" was just entering the economy and ushering in a whole new sector of companies, and the NASDAQ was the breeding ground for these new pioneers. The American public was not even paying attention to technology stocks at this point. Yet looking at the chart above you could easily label it as a blow off top, or the peak of a bubble. Of course we now know what happened after 1991. The bull market was only beginning. 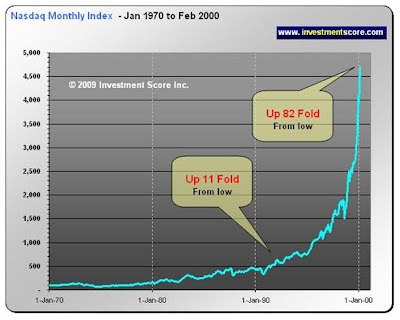 The chart below shows both the original 11 fold increase in the NASDAQ, which looks like a tiny speed bump on an enormous mountain, and the real blow off top which came 8 years later in 1999. This was the moment when the public entered the market. They came rushing in together, as a herd, and doubled the NASDAQ in just over a year from its already high price. This was a true bubble. People felt that stocks could not fall, that we were in a "new" economy. Pets.com and other worthless dot.coms with no earnings launched IPO's and the stocks traded with higher valuations than GE and Walmart. Today the silver chart is identical to the NASDAQ's of 1991 and just like then the public is not even paying attention to it. Will silver's chart repeat the NASDAQ's? I think it will do better. I believe this will be the greatest mania in history, bigger than both dot.coms and real estate. When this market reaches the final stage, the euphoria stage, everyone will be talking about it. The American public will rush in, as a herd, because they will feel that silver cannot fall. It will be the new safe investment. And it will be time to sell.